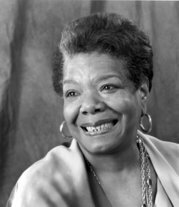 Maya Angelou (born Marguerite Ann Johnson on April 4, 1928 in St. Louis, Missouri) is an African-American poet, memoirist, actress, and civil rights activist. She is best known for her autobiographical writings I Know Why the Caged Bird Sings (1969) and All God's Children Need Traveling Shoes (1986). Her volume of poetry, Just Give Me a Cool Drink of Water 'Fore I Die (1971) was nominated for the Pulitzer Prize. She has published numerous other collections of verse and was an unwed mother. To support her young son, Clyde Bailey Johnson, born in San Francisco, she danced in night clubs, cooked at a Creole cafe, removed paint at a body shop, and was a madam and prostitute at a San Diego brothel. However, she soon returned home, to Stamps, Arkansas, then Louisville, Kentucky. While working in a record shop in 1950, Marguerite met and married Tosh Angelos, a Greek-American sailor. They lived in relative comfort in Los Angeles, California, but social disapproval of their mixed-race marriage caused the relationship to end after a few years. Angelou's early activism led Martin Luther King, Jr. to request that she become the northern coordinator for the Southern Christian Leadership Conference in the 1960's. In the early and mid-1960s, Angelou was an editor for newspapers in Africa, including The Arab Observer in Cairo, Egypt and The African Review in Accra, Ghana. She returned to the United States in the 1970s, being named a member of the Bicentennial Commission by Gerald Ford and a member of the Commission for International Woman of the Year by Jimmy Carter. She was given a lifetime appointment in 1981 as Reynolds Professor of American Studies at Wake Forest University in Winston-Salem, North Carolina. She also read her poem On the Pulse of Morning at Bill Clinton's Presidential inauguration in 1993, at his request. Angelou has had success as a director, producer, actor, and author for stage, television, and film. She wrote the screenplay and score for the film Georgia, Georgia in 1971; the screenplay was nominated for a Pulitzer Prize. She was nominated for a Tony Award in 1973 for Look Away (her debut role), and an Emmy for her role in the 1977 miniseries Roots. She was the first African-American woman admitted to the Directors Guild of America. Comedian David Alan Grier spoofed Angelou while hosting the sketch comedy show Saturday Night Live. Conceptually, the gag was that Angelou (played by Grier) had been hired as the new spokesperson for Pennzoil motor oils. In character, Grier read a poem dramatically, using Afrocentrism as an analogy for motor oil. The bit was repeated during the same episode with Grier-as-Angelou hawking Fruit Loops breakfast cereal. Angelou is said to have requested a copy of the sketch on videotape because she so enjoyed it.